We tested the karts for the OK and KZ2 classes driven by Basz and Hajek in Kosmic colours, great help given by OIP telemetry. this is what we noticed in the differences between the direct drive and gear class. 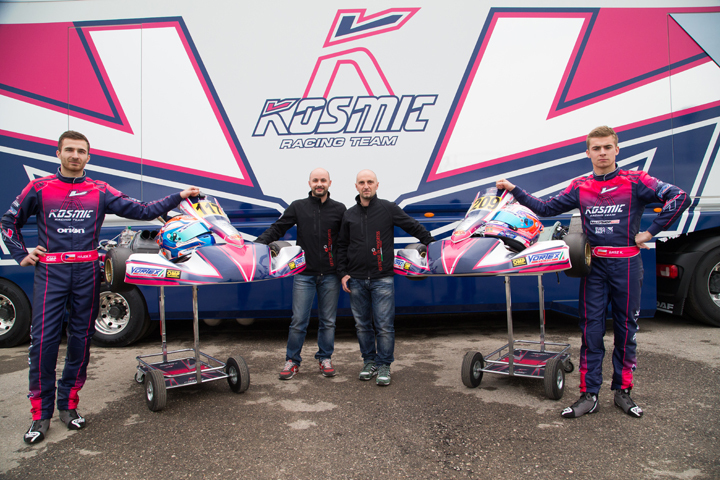 We just couldn’t refuse this occasion, nor could we minimise it, so when the OTK group gave us a chance to try, immediately after the Winter Cup, the official Kosmic-Vortex karts that had raced driven by Karol Basz and Patrik Hajek, we did more than just do a few laps. A chance of lapping with the help of the most winning team spurred us to try and get more out of this test, and our friends from Officine in Progress came along to help us, they filled the kart with sensors, connector and data acquisition blocks. Often under watchful eyes, at times playful and at times a little bit worried, but at the same time interested, not only of the two mechanics who helped marvellously with all the operations (Alessandro Fracasso and Thomas Mardaga) but of also others who were working under one of the best tents in the world karting circus. However still appreciating the skill of assistant mechanics, the support of the official drivers, with whom we worked to take these karts to the limit, is priceless. Also because, obviously, besides being professionals they know their “work instruments” inside out and in any case, at a level that people like the person writing and the other test driver, Daniele Parravano, could ever dream of reaching. On the other hand, it is up to us to describe those sensations that skilled “regular” drivers have long metabolised to be able to explain properly. And the fact that after the test we all practically agreed on everything only confirms this. Let’s take a closer look at what we got emotionally and technically from these two karts. with the KF. To be clearer, round the last turn in Lonato we found that the engine was already in torque well before reaching the external curb – this was so even when the turn in question wasn’t tackled in the best of ways, otherwise you have everything already when you “open” – while the engines from the previous generation gave “signs of life” also only when you were at the end of the external curb. We got the impression that delivery is distributed much better over the revs, and it is good that this result has been reached apparently without any important changes. Thanks to this engine response, it is also much easier to find the limit for chassis response too. As usual for chassis made in Prevalle, among which Kosmic is one of the main brands, physically speaking you have to have excellent steering wheel control. Doing this, when you are physically fit, forecarriage response is guaranteed; also because you have the right evaluation for tackling turns neither too fast nor to slow. We all know the reason for not arriving too fast; rather, talking of “too slow”, the thing is arriving with sufficient speed you can allow the kart to work as it likes, that is loading forecarriage well to give the right direction on corner entry (and hence increase exponential speed on corner entry) and lifting internal left wheel properly. This way you also get improved ground rest and stability when you accelerate again, the chassis is released so as to give a progressive glide on exit. If, instead there has been some hesitation, it’s easier not to get enough wheel lift, or it comes down too soon, ruining set up and the kart starts jumping. The overall candour of the kart does so, however, it allows you to “start off” well and get better and better as you lap. To give you a specific example, it’s the same kart that makes you feel how, at the part of the track after the first turn when you go onto the old track, there is no need to brake too soon and it’s better to enter the turn with as much speed as possible, for you “to rest” well on forecarriage in release and join the two turns that take you to the downhill part. a difference compared to the response of its “little brother” for the OK class. for a water pump if needed, which is usually left externally though. Cylinder and cylinder head are very similar, at least theoretically, for the Vortex 125 RKZ with gears: compared to the DDS, looking you only notice that the valves are missing, from the one on the exhaust to the decompressor valve that characterises the OK direct drive engines. However the barrel isn’t made of cast iron but with a Nicasil insert. In this case in the besides, obviously the gearbox in the base there’s a reed pack that goes better with the 30mm Dell’Orto carburettor. While the driving shaft offers 54.45 mm stroke and it is connected to a 115 wheel base connecting rod made from a solid.